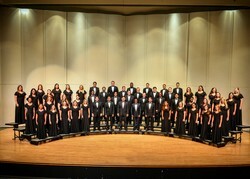 The SFA A Cappella Choir will perform at 7:30 p.m. Friday, Oct. 19, in Cole Concert Hall on the SFA campus. NACOGDOCHES, Texas - Stephen F. Austin State University's A Cappella Choir will present "Music of Our Time" when the choral ensemble performs its first concert of the fall semester at 7:30 p.m. Friday, Oct. 19, in Cole Concert Hall on the SFA campus. The program features choral music of the 20th and 21st centuries, according to Dr. Michael Murphy, director of choral activities in the SFA School of Music and conductor of the A Cappella Choir. The performance will showcase works by Norman Dello Joio, Samuel Barber, Alfred Schnittke, Michael Ostrzyga, Zdenek Lukáš, Jake Runestad, Jocelyn Hagen, Carol Barnett, Joan Szymko and others. "This concert focuses on distinctive and important choral music of the 20th and 21st centuries from the United States, Germany, Russia and the Czech Republic," Murphy said. "Another important focus in this concert will be on American women composers." "Agnus Dei" is Barber's own 1967 arrangement of his popular Adagio for Strings that was composed in 1936. In this setting of the text "Lamb of God, who takest away the sins of the world, have mercy upon us," Barber captures a sense of universal and timeless spirituality, Murphy explained. The choir will perform Dello Joio's 1946 "A Jubilant Song," which exhibits frequent meter changes and syncopations, Murphy said. "The work is best described as pantonal, or not in just one particular key, but shifts freely in many keys," he said. "Dello Joio sets Walt Whitman's cheerful poem 'A Song of Joys,' which describes the many wonderful things that life has to offer." Schnittke's "Three Sacred Hymns" is also on the program. "In the 1970s, Alfred Schnittke moved away from his radical and avant-garde compositional style and began to write with more traditional harmonies," Murphy said. "His 1984 'Three Sacred Hymns' is on this program and features a double choir, rich harmonies and frequent meter changes."